PRINCETON, NJ September 13, 2017 – – ST Robotics announces the availability of its Workspace Sentry collaborative robotics safety system, specifically designed to meet the International Organization for Standardization (ISO)/Technical Specification (TS) 15066 on collaborative operation. The new ISO/TS 15066, a game changer for the robotics industry, provides guidelines for the design and implementation of a collaborative workspace that reduces risks to people. The ST Robotics Workspace Sentry robot and area safety system are based on a small module that sends infrared beams across the workspace. If the user puts his hand (or any other object) in the workspace, the robot stops using programmable emergency deceleration. Each module has three beams at different angles and the distance a beam reaches is adjustable. Two or more modules can be daisy chained to watch a wider area. “A robot that is tuned to stop on impact may not be safe. Robots where the trip torque can be set at low thresholds are too slow for any practical industrial application. The best system is where the work area has proximity detectors so the robot stops before impact and that is the approach ST Robotics has taken,” states President and CEO of ST Robotics David Sands. ST Robotics, widely known for ‘robotics within reach’, has offices in Princeton, New Jersey and Cambridge, England, as well as in Asia. 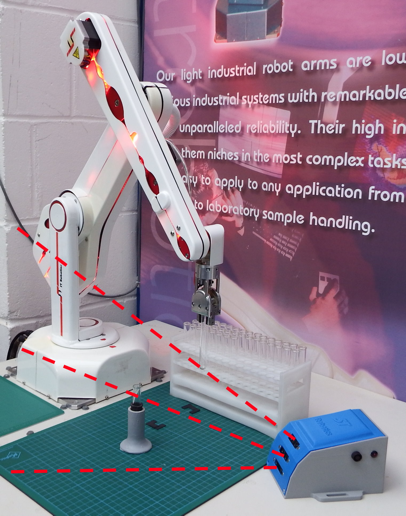 One of the first manufacturers of bench-top robot arms, ST Robotics has been providing the lowest-priced, easy-to-program boxed robots for the past 30 years. ST’s robots are utilized the world over by companies and institutions such as Lockheed-Martin, Motorola, Honeywell, MIT, NASA, Pfizer, Sony and NXP. The numerous applications for ST’s robots benefit the manufacturing, nuclear, pharmaceutical, laboratory and semiconductor industries.